Timothy HorseHage, as its name implies is made from Timothy grass which is very similar to the famous Kentucky bluegrass of America. This grass is higher in fibre and lower in protein than many other grasses, making Timothy HorseHage particularly suitable for leisure horses and ponies, native ponies, veterans and horses and ponies that are resting, convalescing or laminitic. Timothy has a completely different ‘nose’ to ryegrass, from which Ryegrass HorseHage and High Fibre HorseHage are made. It has a similar nutrient analysis to High Fibre HorseHage and is highly palatable, making it ideal for fussy feeders or simply to add variety to the diets of those already being fed HorseHage. Alfalfa is a legume rather than a grass. It has higher levels of protein, digestible fibre, energy, calcium and vitamins than grass. The protein content has the optimum balance of amino acids and lysine, which are especially important for growth, pregnancy and milk production. The high nutrient levels also make it suitable for horses in hard work, poor doers, veterans and show horses. Advice should be sought through our helpline before feeding. Alfalfa HorseHage is available to special order through your feed merchant. There is only one HorseHage!!! HorseHage is the ideal forage for all horses and ponies. It is consistent and reliable and contains just grass alone. When fed as the main forage source, it can enable you to reduce your horse’s hard feed by up to a third. HorseHage is dust free, making it ideal for when your horse has to be stabled for extended periods of time, and comes with a 100% quality guarantee. It contains no chemical additives, mould inhibitors, flavourings, molasses or inoculants, and due to the unique fermentation process, the sugar in HorseHage is considerably lower than other forages. HorseHage is more digestible than other forages, allowing more efficient utilisation of the available nutrients, and because it retains much of the value of fresh grass, HorseHage improves condition and adds a natural bloom to the coat. 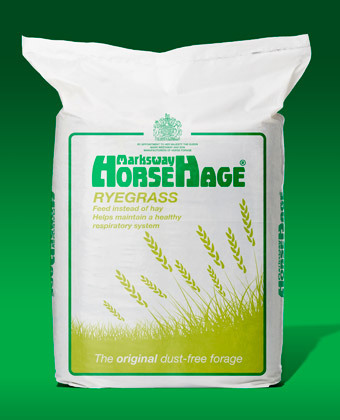 Ryegrass HorseHage is made from a selection of ryegrasses cut at an early stage of growth to provide optimum protein and energy levels. Broadly speaking, it is suitable for competition horses and ponies, hunters, heavy horses, youngstock and breeding stock. It can also be fed to help horses gain weight and improve condition. 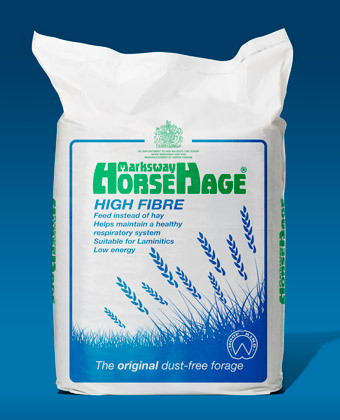 High Fibre HorseHage is made from selected ryegrasses, which have been allowed to mature before harvesting to attain higher fibre, lower protein and lower energy levels. Because it is low in energy, High Fibre HorseHage is generally suitable for Riding and Pony Club horses, native ponies, veterans and those that are resting, convalescing or are laminitic. It also provides an excellent fibre source for competition horses being fed high levels of concentrate.